You probably know we have a GLOGIRLY Facebook Page. Other than our blog, it's the social network we're by far the most active on. But what you might not know is that we often share some pretty fun stuff there that never makes it to our blog. Even our Facebook friends miss over half of what we share, what with the flurry of Facebook news feeds and their crazy algorhythms that decide who sees what. We thought it might be fun to share some of the previous week's faves. We'd love to know what you think too. Do you like it? Is it fun? Or, as Gloman would say, "Snore me a river." Let us know in the comments if you might enjoy seeing our favorite Facebook moments on a regular basis. Thanks! We like to see stuff on Facebook cause the woman is often surfing there when she should be working (hence her need to sit on a cat toy to loosen up her sore hip). We even shared Waffles on our author page. I try and keep it to important stuff, like Katie and Giveaways on my page! 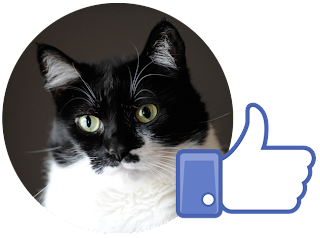 My human and I both have so many "Likes" that things pass through our newsfeeds in a flash! So I vote yes. P.S. "Snore me a river?" That doesn't even make sense! Another odd human colloquialism, I presume. The funniest thing I see rarely make it to fb or even bloglandia, because I'm laughing so hard I can't click, or because they're not what I think most people would find funny. So yes, it would be great to have a little "Best Of" post once or twice a week! I love this idea. It's hard to believe but a lot of my readers are not on Facebook and are missing out. Most bloggers will post and share things that are not at the blog. We love your FB posts and pics! We like seeing the stuff from Facebook. We liked your page some time ago, but it rarely shows us what you post! Bad Facebook; no tuna for you!! We make a point to check your page every day we can! We love your pics & stuff! Happy Furday! We love your FB posts. We usually see them because Mom is ALWAYS on FB....she needs to get up and spend more time with US! Those are great. The woman hasn't had time to go on Facebook much lately. Something to do with children going back to school and a new 55-200mm lens. We think she's just slacking and eating biscuits. We follow you, but missed a couple of those. Mom doesn't know how with so few friends (well, that didn't sound good did it?) how she still manages to miss things. Well, this time of the year mom always misses things because work is "up to there". We'll surely keep our eyes open though, cause there's always fun stuff. pee ess: even the UN-Cats follow Glogirly! We would love to see Facebook Favorites! You are right, Facebook keeps switching things up and it gets all wonky, so sometimes we miss great posts. You know, with WORK and CHORES and stuff. We've seen these since we're on FB...but we love seeing them again...and we're sure others would love to see them too since not everybuddy is on FB. We also share things on FB that we don't share on our blog. MOL MOL MOL! I loved teh last one especially! It is one thing we've never joined although my resolve is weakening as it seems that everything is gravitating towards FB! We are glad you shared on your blog. we iz knot a loud on face book sew we think thiz iza grate eye dea !!! Thank you for sharing. Mommy isn't on FB very much, and hasn't really figured it out. Mostly she gets emails from her niece reminding her that there are new pictures of her crew (8 kids! )and Mommy sorta figured out how to see them. Sorta. Mommy's getting old. And technically challenged these days. I enjoy the FB posts. I just don't get to go on there very much so I miss a lot of them. I do not and never will have Facebook, so if you want to share that's O:K by me. But when it comes to the piano... well... I wanna hear Flight of the Wafflesbee again! You make us giggle over there too! We don't get chance to get on FB very much so we missed all these pictures. That last one cracked me up!!!! I missed them all on facebook!!! We like this post-it's easy to miss a lot on FB with so much going on. Have a great weekend! It did take awhile for this post to pop up on our computer but it sounds like a good idea. I may copy it next time TW gets writers' block. Not that I ever post anything except about the blog. Pop usually tells us about the fun stuff you post on FB. He's good that way since he doesn't have any friends, his newsfeed isn't busy like mine. Hey, I just noticed Pop got a shout out. MOL! We don't have an FB account. We got to see them only here. We love them. Hope there'll be more. Our human is not allowed to be on facebook at work, so she misses so, so much good kitty stuff! !